Today I read in the New York Post’s real estate section about Atelier, a building in Midtown that will let buyers put their down payment for their condo on a American Express credit card. How stupid is that?! Putting down payments for a condo or house is not smart. It is risky for both the seller of the building and the home buyer. The home buyer can mess up their credit if they cannot pay off the balance right way. For the seller, there is the cash flow delay inherent with credit cards. A certified check is really “money in the bank”. Funds are immediate with a certified check. The seller could also be hit with credit card chargeback. Any credit card charge can be disputed. Plus, what if there is identity fraud by the potential “buyer”? The seller would have little or no recourse. Bottom line, incentives are great but both parties (seller and buyer) have to look at the financial risk of using a credit card for a critical thing like buying your home. 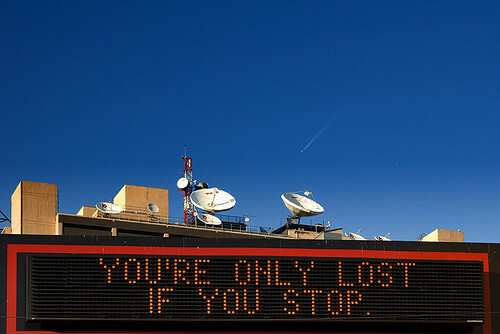 You’re Only Lost if You Stop – MDPNY20070516, originally uploaded by mdpNY. If you are getting organized for tax filing, don’t get stressed out! Keep it simple. Your money is coming out of four main places: business bank accounts, business credit cards, cash, or personal accounts.Make a list of what you need, then contact your bank to get if statements are missing. Here’s a basic checklist of what you need. Bank Accounts: Collect bank statements from your business checking account from last year. You will need January 2008 if your December bank statement doesn’t include through December 31, 2007.
Credit Card: Gather all credit card statements business account from last year. You will need January 2008 if your December statement doesn’t include through December 31, 2007. Cash Receipts: Unless you plan on returning something,only hold on to ones that are deductible expenses like taxi receipts. I personally try to pay for anything business-related via debit or credit card so those pesky little receipts don’t pile up. Personal: If you made purchases or paid business expenses via a personal checking or personal credit card, then go through your statements and check off every business expense so that they can be included as deductible expenses. I am now the organizer of Just Start Meetup Group in New York City. A meetup of people who want to start a business, have been a business for a year and need a little help, or for people who specialize in providing services to small businesses. Created by Intuit, this is a way for business owners to connect offline and share stories. Our first meeting will be in March and will be about a fun subject, TAXES. I have to figure a date and venue this week. Wind Powered: After writing about Con Edison Green Solutions that Little Cupcake Bake Shop uses, I wanted to provide a link in case other small businesses want to learn about it. Filtered: Check out the Sproutwire (Beta) which is a new site that cherry picks rather than just aggregates small business news for you. Crocs in Parma, originally uploaded by Zé Eduardo…. So what gives?! 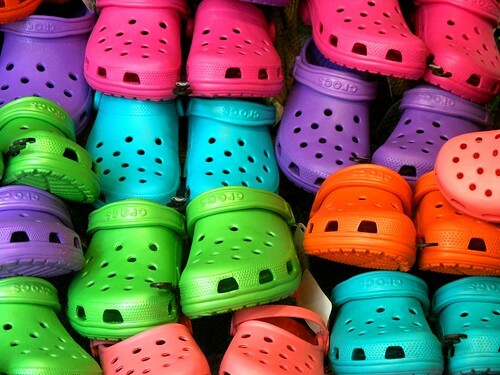 The people at Crocs say that there margins were affected by unexpected demand which caused high shipping costs. How does this affect you, Mr. or Miss Small Business Owner? Well, it is a reminder to manage your shipping and delivery costs and price your products and/shipping fees accordingly. With postage costs going up and gasoline prices rising, it can be quite costly because it may cost more to ship which can cut into your profit margin. If you have a product that sells very well overseas, then you may want to consider working with a company that help you. It can be a consignment deal or a warehouser that can get product directly to your customers cheaply. Also, Crocs may have simply missed the mark because they totally underestimated demand. This is when too much of a good thing can be bad. How can you anticipate demand? Look at the trends. If sales have been steadily going up and at a fast pace, then profit projections need to be re-evaluated. Today, I met with a client and her husband to work on setting up Quickbooks. Since they have a business together, but also do freelance work, I needed to figure out whether it was necessary to set up a separate Quickbooks file for each. That got me thinking about how married couples should file their taxes. Taxes more than love will keep us together, or not. For income taxes, should you file married jointly or married separately? With most things in life, it depends. The objective is that you want to get the biggest tax benefit, so you have to evaluate which method is best. You will have to look how much income each of you made during the year, who incurred the most deductible expenses and maybe what state you live in. Usually married filing jointly can yield a tax savings, particularly where the spouses have different income levels. If you have children it is almost always better to file jointly since you take full advantage of adoption expense credits and dependent child credits. Filing separately may be good if you a lot medical expenses and itemized deductions. If you are doing taxes yourself, I suggest running the numbers through TurboTax both ways to see which one is best. Keep in mind the business deductions on your schedule C as well. Reminder: 54 Days to April 15. Shoeboxed: The company that will scan your receipts also offers a Quicken Export option. Billing: GoTo Billing is an invoicing solution for online businesses. It allows for businesses to issue gift cards to customers.